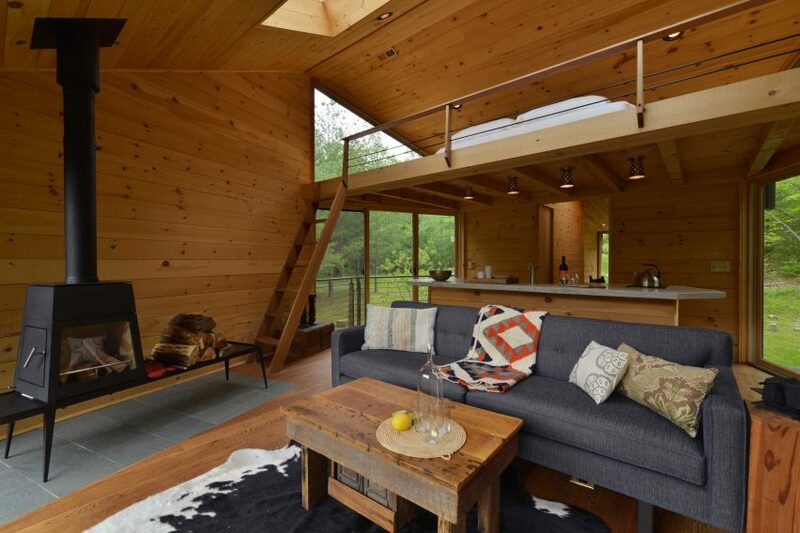 This elevated, cedar-clad treehouse in New York’s Ulster County features a huge window that offers views of woodland and mountains, and a path to a lake and a hot tub. Designer Antony Gibbon, who is currently based in Bali, completed the Inhabit structure for a forested parcel located outside the town of Woodstock, which is less than two hour’s drive from New York City. It comprises a wooden volume, built around a steel frame and clad in locally sourced reclaimed cedar to suit the hues of the surroundings. It is raised above the ground on a pair of angled metal beams, which Gibbon says give “the illusion that the building is floating out of the side of the hill”. “The owner was open to the direction and wanted me to replicate the conceptual design as much as possible, which was tying the building into the surrounding forest as much as possible,” he told Dezeen. Making the most of the elevated position, the large opening punctures the back of the house to offer views of the nearby Catskills mountains from the open-plan living area inside. A large outdoor deck is slotted underneath the raised volume, with stone steps providing access to the large lake and a hot tub. 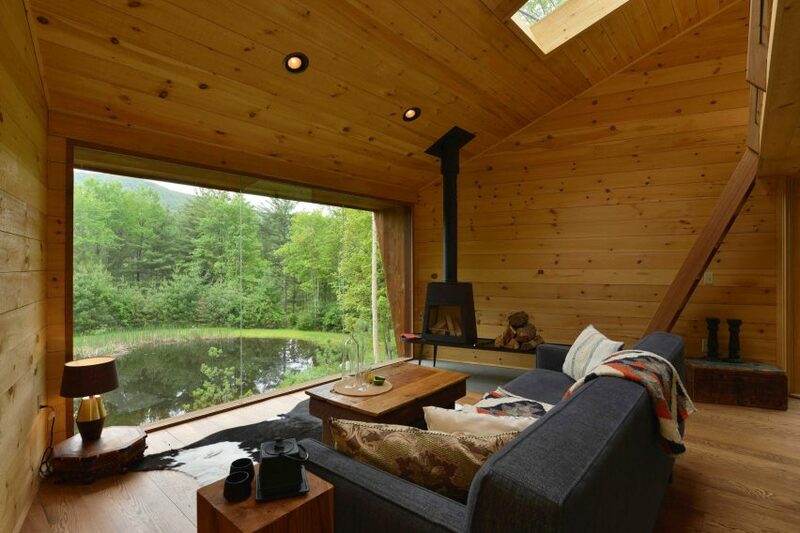 Wood lines the interiors of the front gabled volume, which houses a lounge with a wood-burning stove and a sofa facing the view. In the kitchen at the rear is a wooden island topped with a concrete counter. 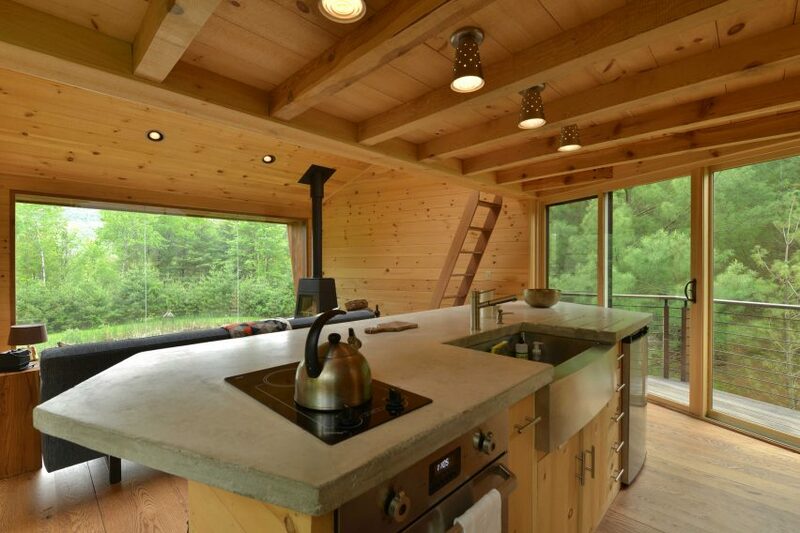 Glazing runs up the corners of the room and opens onto a pair of balconies that flank the treehouse. On one side, the glass also stretches up to the mezzanine bedroom floor, which is placed above the kitchen and accessed by a ladder. A wood-lined hallway leads from the kitchen into a “box type unit” at the back, occupied by a shower room and bathroom, and a second bedroom. Upstate New York is a popular getaway spot for city residents venturing north at the weekends. Also in the area, Manhattan studio JacobsChang built a tiny blackened timber cabin on a shoestring budget. Other recently completed treetop dwellings include a house in a British Columbia valley that’s meant to be shared by campers and creatures, and a spruced up design in Aspen.